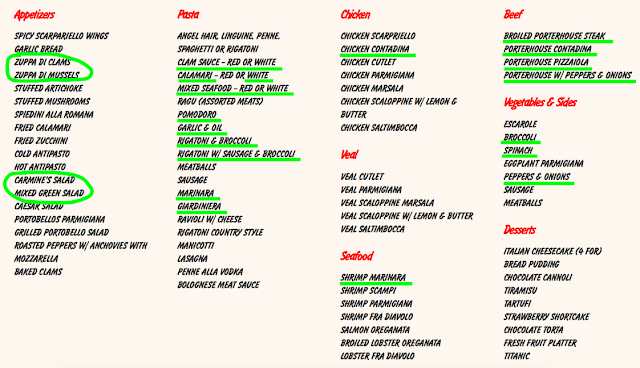 Carmine's has allergy menus available upon request, which cover dairy/egg, wheat/gluten, and garlic allergies. Additionally, they have vegan/vegetarian items. The following items I cross checked are highlighted in green if they appear on both menus. You can see my post featuring all of these menus right here. Because I had a large salad for lunch, I decided I was only ordering a pasta because I didn't want to carry a whole other meal on the train back to Baltimore with me if I had ordered a side dish as well. 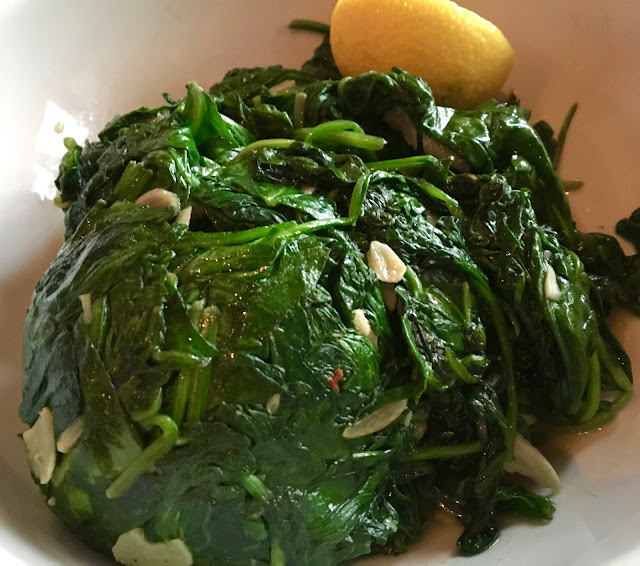 Although Carmine's serves family-style, I was dining solo, so I ordered a "lunch" portion of my pasta of choice, which could have easily served 2 people. The full-size platters I saw at tables around me were massive, serving up to 3-5 people per dish. 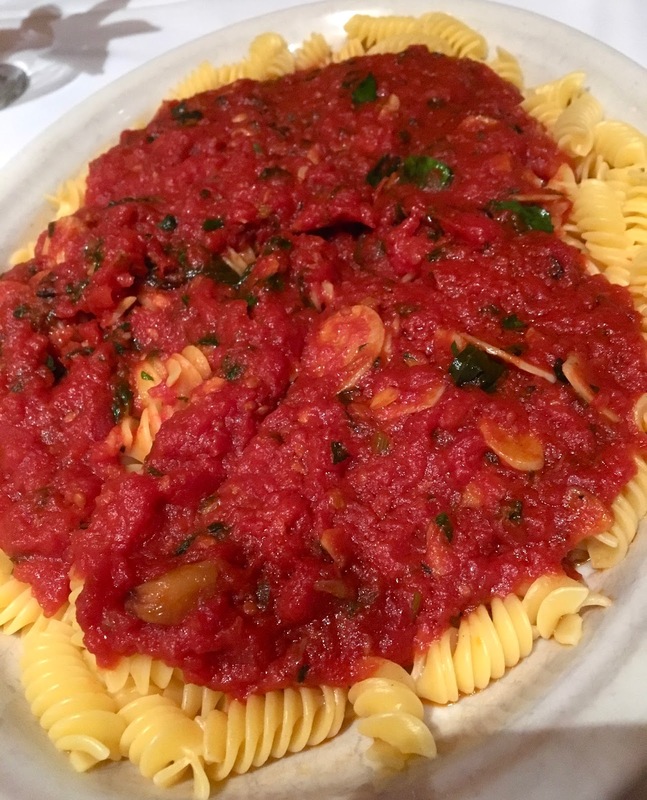 Carmine's pasta is corn-based, and is made with cornmeal and water. When I ordered, I went by the directives on the menu. My waiter said that the kitchen would be alerted that it was an allergy order, and would take steps to ensure it was safe, including making the pasta in fresh water. After debating, I ordered the marinara pasta. With gluten-free noodles, the only other modification was ordering it without cheese. Although I was warned, I was nevertheless impressed by the ample serving. 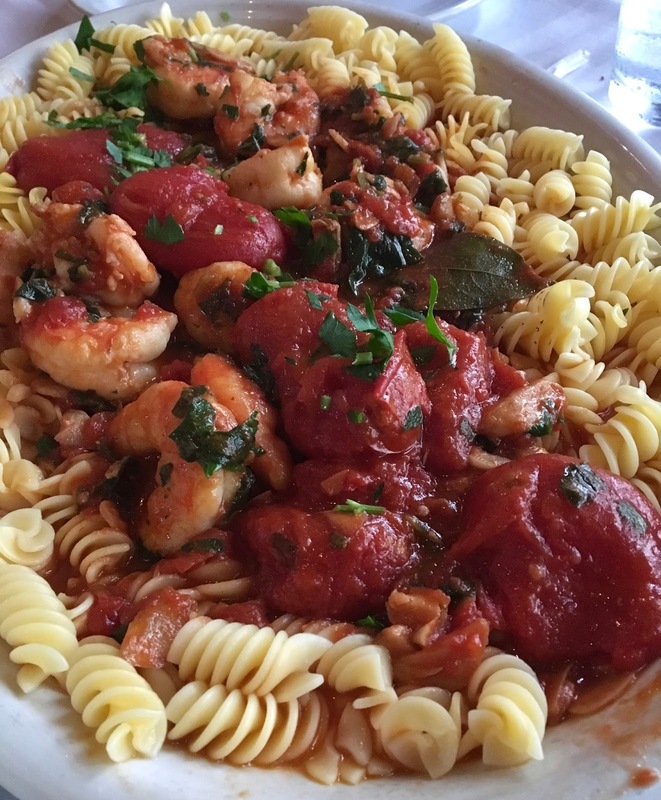 Topped with a thick, bold marinara chock full of plum tomatoes, the pasta was bursting with flavor and earned it from notes of garlic and basil. The pasta was cooked to al dente, and the shape allowed each noodle to carry the flavor of the sauce. Although seemingly simple, I adored every bite, and it had a sublime comfort food quality that was perfect for the drizzly day. My experience was wonderful from the food to the service to the price of my meal. Two generous servings of gluten-free pasta for only $15? That's unheard of at most restaurants, much less in downtown D.C. It was just as nice the next day to enjoy my leftovers for lunch, which lost none of it's flavor or form. Next time I visit Carmine's will definitely bring friends because it's the kind of place that's more fun shared with several people. Even so, I left full and happy, which is all I ask for when I dine out. Update 6/9/17: On a repeat visit, my dad and I split the full dinner portion of the shrimp marinara pasta with no cheese and over gluten-free noodles. Oddly, the pasta took over an hour to come out from the kitchen, which the manager attributed to cooking the gluten-free pasta. This wasn't the case in my experience before, and it was odd that most of the other two-member parties around us were seated after us and finished before my dad and me. The pasta was perfectly al dente, like before, and the sauce was extraordinary- the plump shrimp took a starring role and had a delicious flavor. I would have liked there to be a better sauce-to-pasta ratio, but nevertheless the dish totally satisfied. Between the two of us, we polished off the dinner portion, but we were both really hungry. I'd say it would serve 2-4 people comfortably depending on appetite. The long wait without explanation was an early downer on the meal, but the pasta itself was great. However, when receiving the bill, I got another shock- they charged for the pasta. While I don't mind an uncharge for gluten-free items, I was not charged extra before, and there is no mention of an uncharge on the menu or from the wait staff. Consistency is key, and I was frustrated to have two very different levels of service and experience on two separate locations. I also ordered a side of spinach, which is a massive portion. It is steamed and garlicky, good, but my dad and I hardly made a dent in it despite eating a good deal of it. 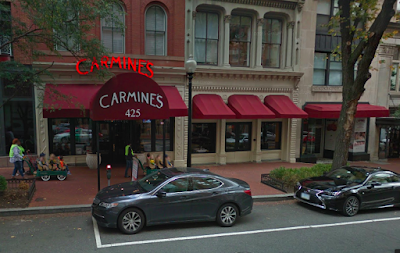 I know Carmine's is all about "family style" dining, but it would be nice to have an option of ordering individual sides to keep the main entrees family-style but not have so much food go untouched. Price: $15 (incl. tax) for lunch-size pasta. No upcharge for gluten-free pasta. Special Feature: Make reservations on Open Table right here. I highly recommend securing one because the night I visited they were not seating people without a reservation.